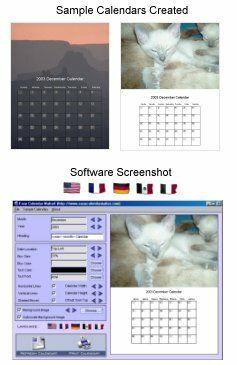 Calendar Software to create calendars! With the Easy Calendar Maker, Create and Print photo calendars using your own or professional photographs in seconds. See any changes you make immediately in the calendar preview window! It's fast! Ability to create standalone calendars. Quickly change the height, width, and position of calendars simply by clicking to your personal tastes! Customized Calendars make great gifts! Save money, plus show you care with calendars for birthdays and holidays! Capture pictures of your pets such as kittens as they grow up, and mark it on a calendar! Save Time & Money! To print only one calendar professional costs more than software! Plus, you can print as many copies as you wish, giving it to friends and family, letting them remember you with your custom calendars! See any changes you make immediately in the calendar preview window! It's fast! Quickly change the height, width, and position of calendars simply by clicking to your personal tastes! Qweas is providing links to Special Promotion 2011 as a courtesy, and makes no representations regarding Special Promotion or any other applications or any information related thereto. Any questions, complaints or claims regarding this application Special Promotion 2011 must be directed to the appropriate software vendor. You may click the publisher link of Special Promotion on the top of this page to get more details about the vendor.